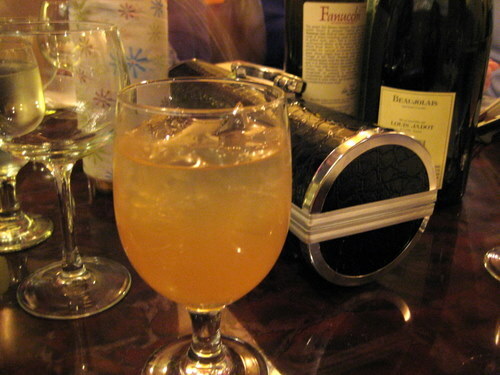 Since it was a BYOB, M made us some pre-dinner gin cocktails. We b’d plenty of our own b’s. We even offered a drink to one of the waitresses, but she refused! We all decided to do the turista menu, which allows you to pick anything from the antipasti, pasta, secondi, and dessert menus. The bread was unbelievable. 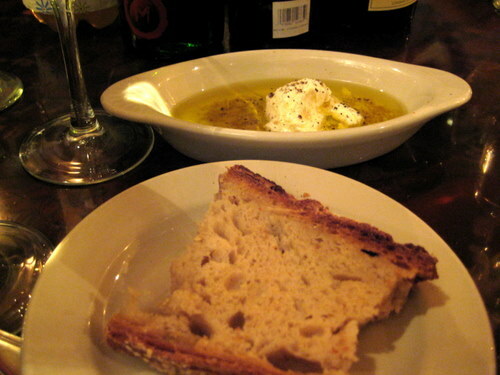 It’s served with a porcini olio, which was also beyond delicious. The bread is incredibly dense and wet and chewy on the inside. Things were starting off well. Before the food started coming out, we got a little amuse bouche, which was a bruschetta with tuna puree. The bread was a bit too salty on the crust, but overall, it was a great little taste. 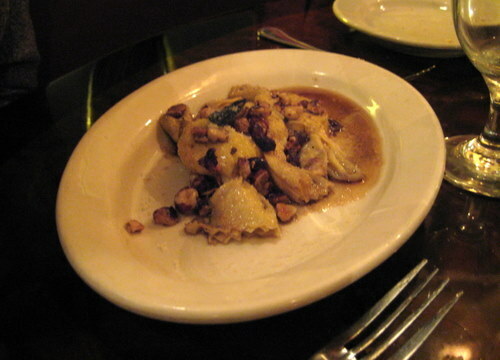 For the antipasti, a few of us got the cervello, the fried calves’ brains with walnuts and pickled fennel. Who knew fried brains would be so good? 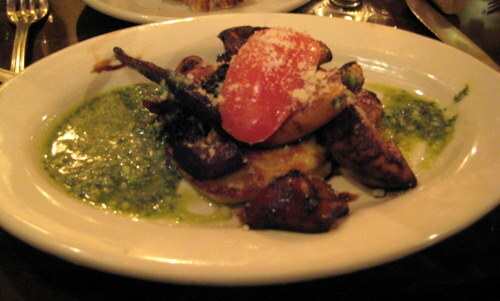 I ordered the Polpo, the balsamic grilled octopus, crispy potato cake, with arugula pesto. Wow. Just wow. The octopus was tender and delicious, and the crispy potato cake, although not crispy, was so surprisingly good. People are afraid that octopus could possibly be rubbery. This octopus was the furthest from rubbery as anything possibly could be. For the pasta, M got the Caramelli, fresh pasta candies (look how cute they are!) stuffed with buffalo milk Taleggio and hazelnut brown butter. The cheese was super creamy and delicious in here. So rich! 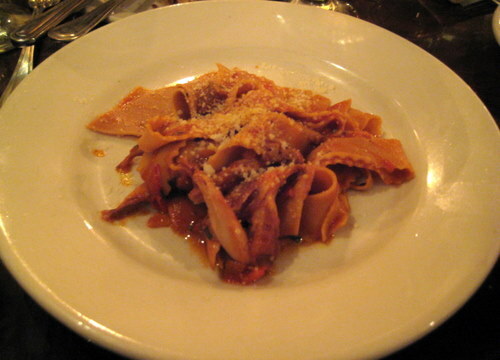 R and I both picked the Mlinzi, toasted fresh pasta with a rustic rabbit ragu. So good! The pasta was extremely firm, I guess that comes from the toasting. 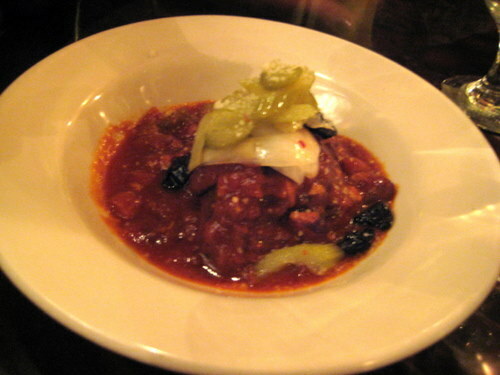 The ragu was made with sweet peppers so it had a surprising sweetness. F’s lamb dish, the Agnello. 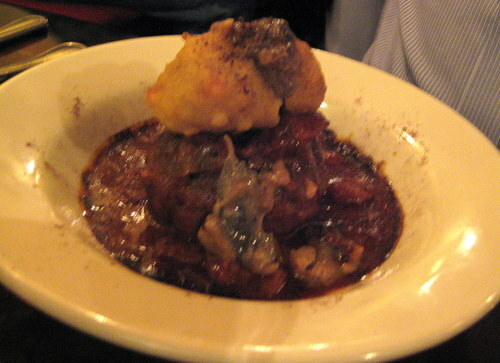 It’s typically a braised lamb chops dish, but this night, it was a giant lamb ball, served with porcini and apple fritters. Three of us got the Guancè, the veal cheek served chef’s choice style. The menu says “trust him”. It’s a good idea to do so. Delicious! Again, this is a bit on the sweet side. I think E would have preferred that it was less sweet. The cheek itself was nice and tender. 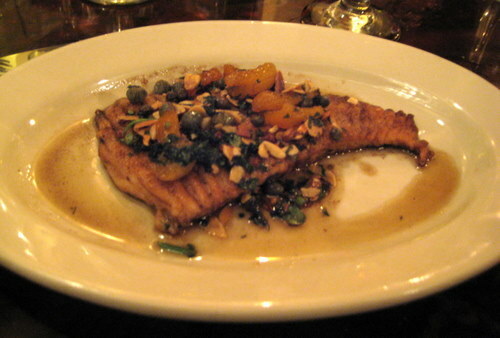 I was in the mood for something on the lighter side for my entree, so I went with a fish dish and picked the Razze, seared skate wing with apricot brown butter, almonds, capers, and lemon. It was exactly what I wanted! The fish was perfectly cooked and the whole dish was light. 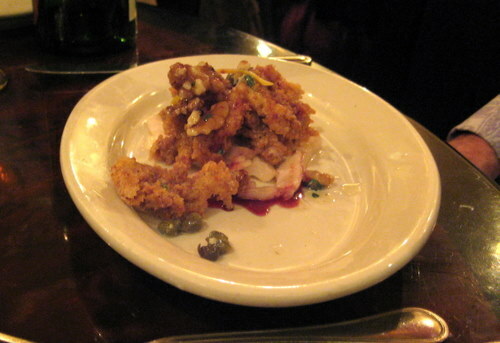 I don’t like capers so I ate around them, but I loved everything else. The apricot chunks were a really nice touch. For desserts, the options included tiramisu, a flourless chocolate something, an italian style crepe with nutella, and I forget what else. A few went with just cappuccino or espresso. Because I’m into fruits in my desserts, I got the apple pastry. 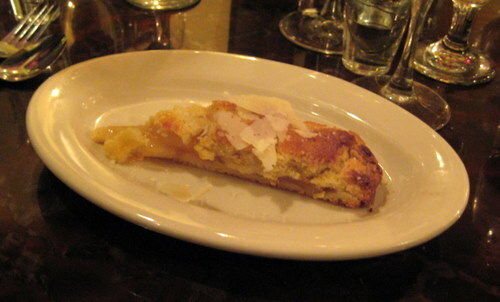 It was somewhat like an apple pie, but one that had shavings of cheese on top. It was nice and light and a perfect way to end this meal. 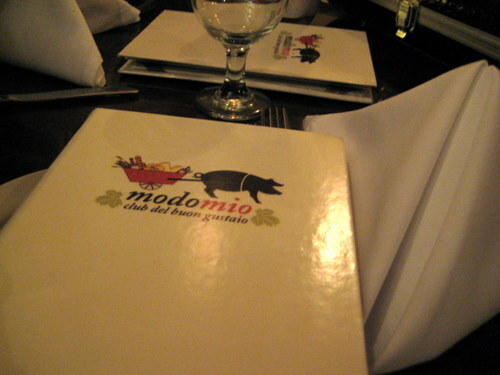 Really, the entire meal and experience exceeded all of my expectations. The service was also good, provided by our very actorly waiter, Steve. The place is small, and you’re all definitely squeezed in. It’s also quite loud, so don’t expect a quiet and serene place that is romantic. It’s boisterous! But the food is some of the best I’ve ever had. I implore everyone to visit! I’ll definitely be back! This sounds wonderful. Thanks for the review! I think I’ll be trying that fish dish when I go. i’m sure whatever you get will be delicious! Excellent review & good pics. Calf Brains, Octopus, Veal Cheek Skate & Lamb – good variety and they all sound delicious…thanks for the details! it was just swell all around, i can’t wait to go back and try everything else!